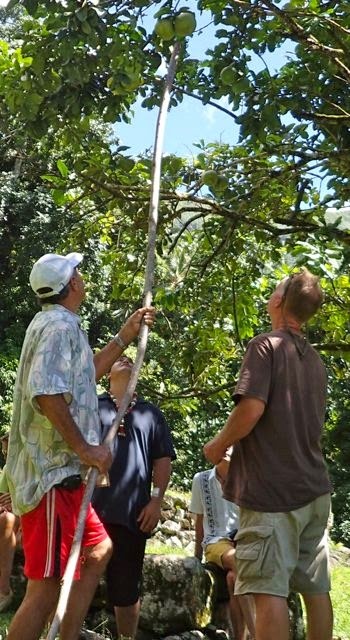 was carving pomme citron with his handy machete. At Hiva Oa’s Tahauku Bay dinghy dock, nearly every morning by 8 am, John Ozanne, a spry gentleman in a baseball cap, red shorts and a Hawaiian shirt hovers politely. As bedraggled cruisers puzzle over how to tie off and scale up the tiny concrete dock in the heaving water, John lends a hand. As well, he’s just as quick to assist in carrying full water jugs…. John’s small silver tour truck, topped with a semi-open shell covering bench seats, a long ways from their home base of Hana Menu, await as well…. Sometimes John’s fortunate enough to pick up a group who’s reserved his tour; even more rarely they show up, on time for John’s 8:30 am start, already savvy about the Marquesas’ odd half step of one half hour behind Tahiti. Lucky folks – they are in for a treat! *4000 CFP, if there are at least 4 folks on the tour; otherwise it’s 5000 CFP per person for two. $1 USD = ~ .88 CFP and add 2 zeros when we were in the Marquesas, though we tended to calculate the exchange rate as if it as $1 USD = 100 CPF – or – just drop 2 zeros. on John’s extensive island tour. 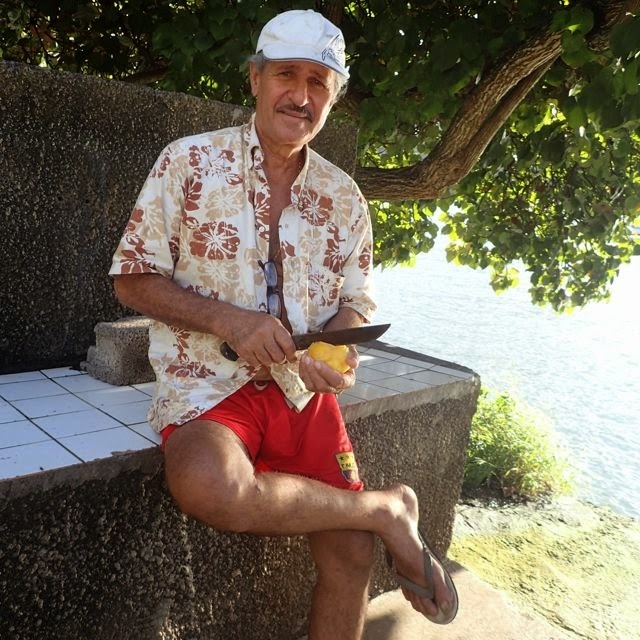 John knows the island and his neighbors intimately, and shares eagerly and generously. 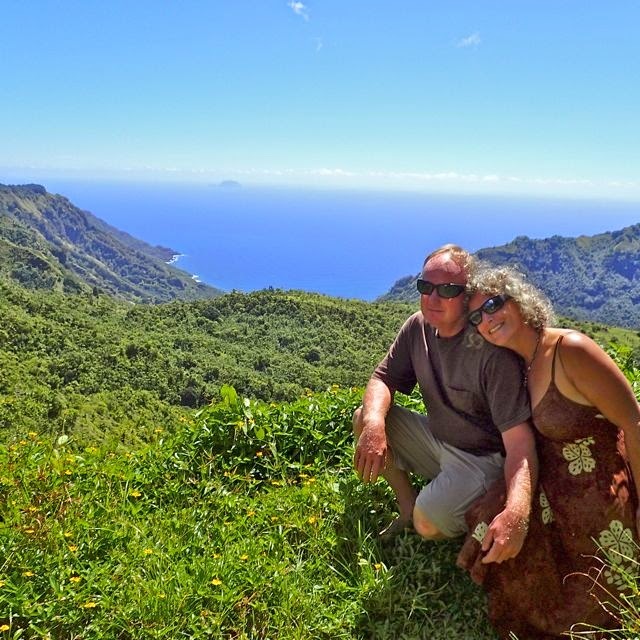 He moved to Hiva Oa as a teen, perhaps about 50 years ago and can regale you with tales of his exploits, like making the 11-hour hike from Hana Menu to Atuona town each weekend in his youth. John still exudes that sense of slightly mischievous youthful energy – traveling with a big kid is big fun! Hiva Oa bay dazzle their jewel tones. Our first stop was down a dirt road, then a little trail, around the corner past a burial tomb, then onward to the tiny smiling tiki. It’s believed her purpose is to bless to the fishermen. island tour. Note the tiki on his immediate left lost its head…. Near the smiling tiki, John pulled out his trusty machete to introduce us to unripe pomme citron. He hacked one down, whisked off its skin, and cut us thin slices of the oblong fruit, reminiscent of a very tart green apple or pear. 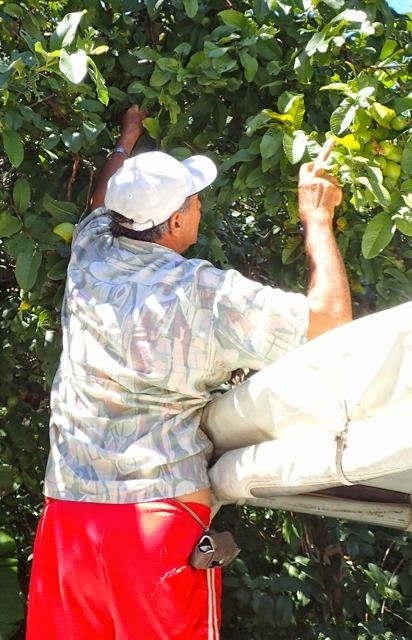 John clambered atop his truck to access yet another fruit… several sweet yellow-skinned perfectly ripe guava. 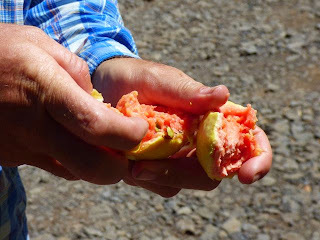 He showed us how to simply tear them open to savor the sweet ripe pink-orange pulp inside. 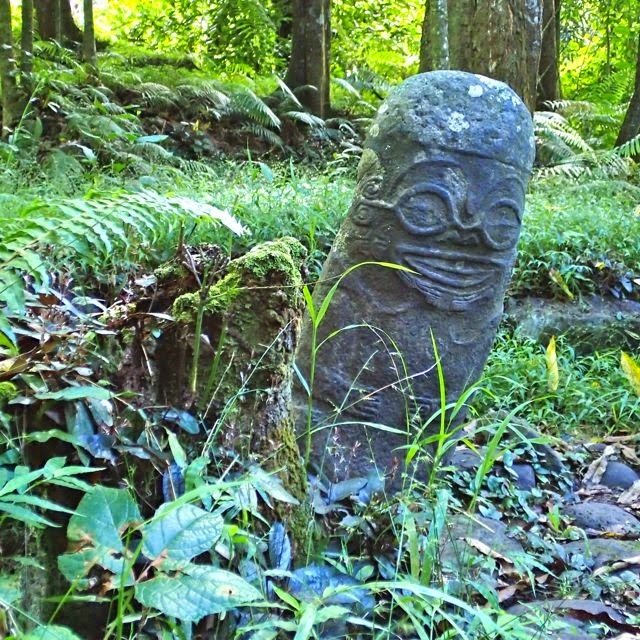 on an existing tiki at Iipona on Hiva Oa. Ever ready to please, John asked, “Would you like to stop at the airport?” Sure, we agreed. Wayne’s an aircraft mechanic, so island airports always intrigue us, and besides, you never know when you need a public bathroom…. On the way, we passed though a small pine forest – which Steve alerted us to prior. Then over hill and dale, and many a lookout point, some we stopped at, some we just enjoyed passing by. 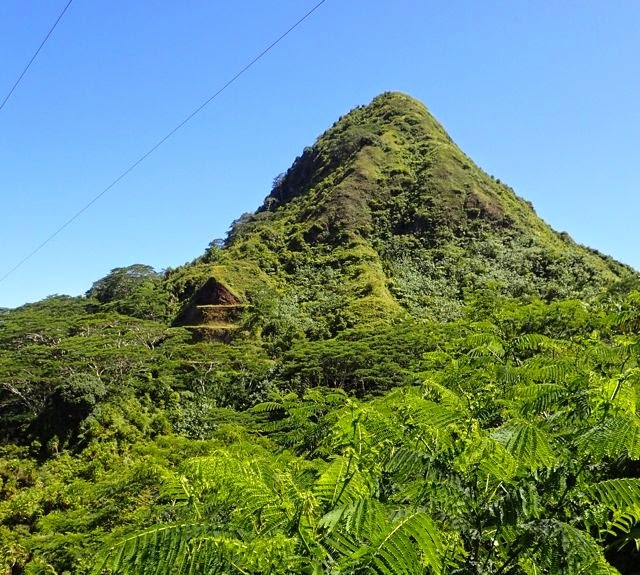 Hiva Oa is chock full of beautiful bays, verdant vista points and dramatic dark basalt cliffs. At our first vista, further up the road, John pulled over to share a stunning territorial viewpoint. There he rolled out several pamplemousse, hacking them into healthy bite-sized chunks. Wayne, who dislikes grapefruit, willingly ate this sweet grapefruit-like fruit. We licked the delicious and slightly sticky juice from our fingers. John passed around a water bottle for us to rinse our fingers. 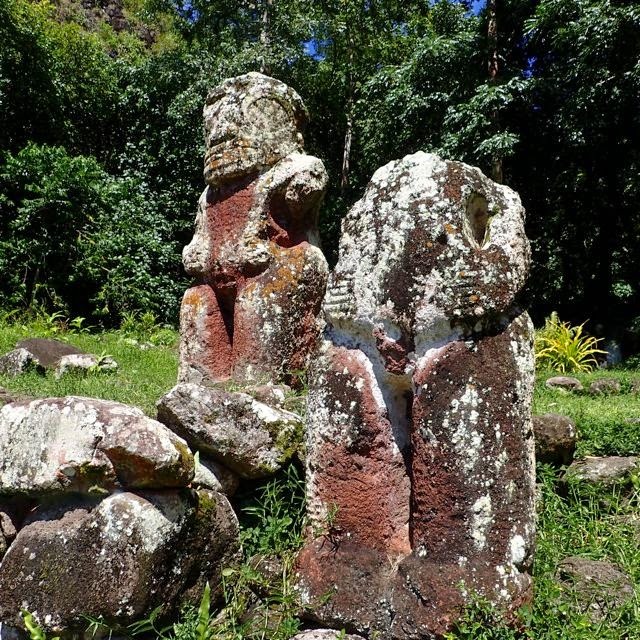 Closer look at two of the Iipona tikis. We oohed and ahhhed at the many vistas along the sometimes well paved and other times exceptionally rugged road. Ever the mechanic, Wayne asked, “John, how often do you change your brakes, given these roads?” Every six months, John answered. “And your last change?” Wayne probed. “Six months ago,” John replied, not missing a beat. We stopped by a farm where John told us we could buy banana vinegar and salt-cured limes, but no one was home. “At church,” John guessed, as it was Sunday. Their farm site opened out to a beautiful black sand, coconut palm fringed beach. We bade our hellos to their dog, cow and pig. 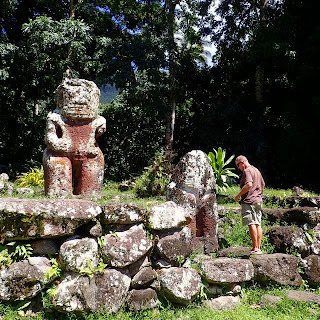 on his Hiva Oa tour. As well, John waited patiently while Shelly of Firefly and I went gaga over a gaggle of goats on a point overlooking a few bays. Of course we stopped at Iipona. “One of the best preserved archaeological in French Polynesia” -- a “Top Choice according to “Lonely Planet’s Tahiti and French Polynesia” guide. 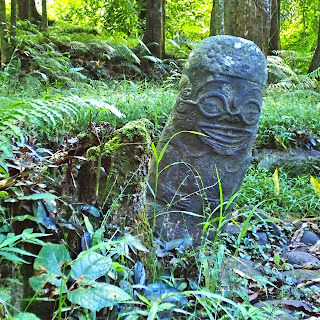 It’s a lovely, tiered expanse, surrounded by lush trees and prolific flowers, scattered with larger-than-life tikis. 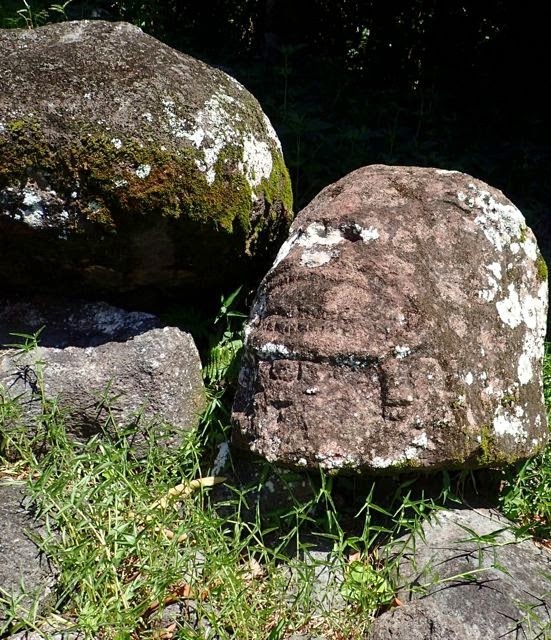 John pointed out the rocks used to set up for tattooing, the outstretched fertility woman with a dog carving, the headless tiki and its nearby head…. Further down the road, we lunched under the shaded commons area of a gardenia***-scented church. We gazed out over the surf beach across the street, where preteen locals played amidst the crashing waves. ***Tiare, a simple, white and pungently fresh-scented gardenia is French Polynesia’s national flower and the primary flower used in local leis. Hiva Oa bursts with a wide variety of lushly textured foliage. 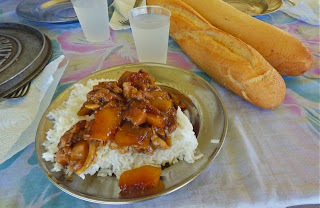 “Guess what’s in it,” challenged John as we sank into his sumptuous chicken dish, spooned over delicate jasmine rice. We were stumped. Papayas, John explained, sliced, cooked for just a few minutes in boiling water, and then added at the very end. “Eat it with the bananas**,” John urged, also handing out baguettes, slathered with buttery avocados from his garden, and very ripe star fruit slices. We were stuffed yet it was all so delicious we greedily ate seconds, quaffing it down with John’s refreshing homemade limeade. 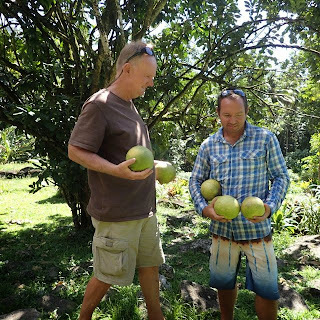 **Tiny South Pacific bananas taste far more fruity – almost like a creamy peach – than their larger sized sweet, starchy imported cousins we’d purchase in the grocery store in the U.S.
Back in Atuona town, we waited for the shops to open after their lunch break. We wanted to purchase some groceries while able to take advantage of John’s truck, rather than carrying them the half hour or so back to the anchorage. We returned at Tahauku Bay just a little before dark, happy, still full from John’s fabulous lunch and laden down with local just-plucked fruit and cameras with batteries as tuckered out as we were. over rice, with baguettes and fresh squeezed limeade to drink. 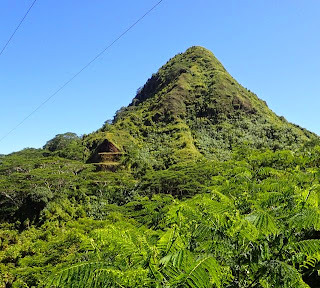 If fortune finds you in Hiva Oa, take a day out for John’s island tour. It’s a great tour and he’s a heckuva nice guy. for convincing Wayne to pose for a photo on the tour. We took John’s hike from Hiva Oa’s Tahauku Bay anchorage (S9.48.260 W139.01.924) – our first stop in the Marquesas Islands, French Polynesia. 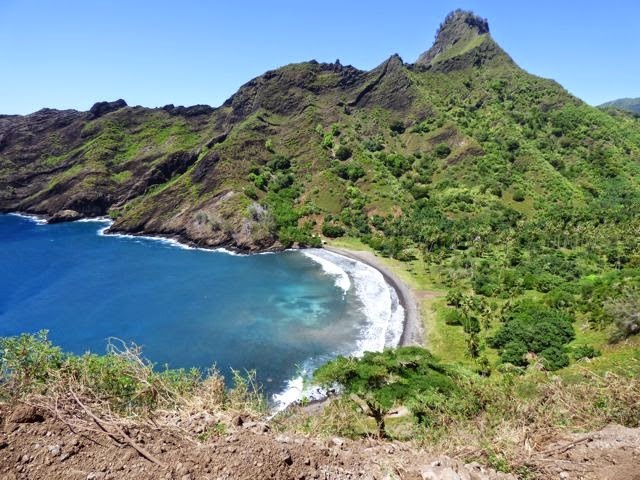 We are currently on our fourth Marquesas island stop, Ua Poa (S9.21.537 W140.02.867). In between we went to Fatu Hiva and Tuahata; Nuku Hiva will be the next and last island we stop at in the Marquesas, before moving onto the Tuomotos, which are still part of French Polynesia.